VICTORIA Falls is fast becoming a popular destination for Photographic Safaris. With a myriad of resident wildlife species in their natural surroundings of the Zambezi National Park, guests on a photographic safari will discover sunsets, bird life and so much more to photograph during their stay at Zambezi Crescent Collection’s flagship accommodation – Victoria Falls River Lodge. Here is the second of a four-part series of interviews with professional photographers who have visited and stayed at Victoria Falls River Lodge. International award-winning photographer, Mark Williams, is recognised worldwide for his evocative images of interiors, lifestyle, décor, architecture and beauty. His speciality is creating exquisite and arresting photographs through exceptional control of lighting and composition. Mark spends his time shooting in both South Africa and abroad and has quickly become one of Africa’s leading Hotel and Lodge photographers. His passion drives him to seek out memorable experiences, fresh challenges and new ways of creating beautiful images for numerous high-end clients and publications in SA and Europe. I firmly believe we should rather hunt animals with our cameras than with rifles, and to leave the wildlife population intact for the next generation to enjoy. One of the best ways to get good pictures of wildlife, I find, is on a walking safari. I did a walking safari at Victoria Falls River Lodge, and we tracked elephants on foot. It really is a very exciting experience for a photographer. You have your feet on the ground – in the bush. The experience is real, nothing is curated – it is just you, your guide and the animals. What is the best time to take photographs at Victoria Falls River Lodge? Sunset is a great time to take photos of the animals, but morning shoots – as the sun comes up over the Zambezi River – were also a time when I got some beautiful pictures. The silence and the solitude of early mornings at the Lodge are very peaceful. There are plenty of species of wildlife coming down for a drink at this hour, including crocodiles and elephants, and you can catch them right on the river’s edge with your camera if you are up and about in time. What else is there to photograph at Victoria Falls River Lodge? The Lodge is such a beautiful place – with its luxury interior design and ambiance – and this, along with the surroundings, will all form part of the experience of visiting Victoria Falls River Lodge. I think photographers – both hobbyists and the more serious photographers – would want to shoot it all. The prolific birdlife is also a nice addition that could form part of a photographic safari at Victoria Falls River Lodge. Favourite memory, photo or experience during your visit to Victoria Falls? 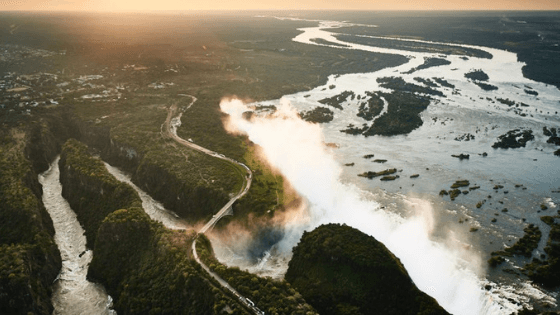 I was fortunate enough to be able to take photos of the Victoria Falls from a helicopter. I was perched on the skid of the helicopter, secured by a monkey strap, and we circled two or three times over the Falls. The river was full, and it was the last flight of the day. I was able to get nice pictures of the Falls with the spray, produced by the thundering magnitude of water, lit up by the setting sun.